PROTECNAVI, S.L., a service company dedicated to the assembly of pipes. 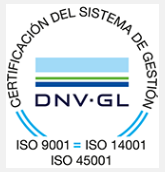 In their desire to offer a more competitive service and adapted to the needs of the market in terms of quality, Environment and assuming that the prevention of occupational risks is an integral part of the management of companies, have a Management System in accordance with the requirements of International Standards UNE-EN-ISO 9001:2015, UNE EN-ISO 14001:2015 and OHSAS 18001:2007. The main objective is the satisfaction of the client, as well as that of all the workers, without ignoring the interest for the benefit of the company. The Management System is oriented towards continuous improvement. Failures must be used to learn and eliminate the sources or causes that have generated them. Management will promote the necessary improvements to achieve the objectives and goals of quality, environment and occupational health and safety. The Management undertakes to comply with the requirements applicable to its products, services and activities; to comply with environmental and safety legislation, as well as with other requirements that the organisation voluntarily subscribes to; to prevent pollution; and to continuously improve the Quality, Environment and Occupational Health and Safety Management System. Quality, the Environment and Occupational Health and Safety require collaboration and participation at all levels, and for this information, communication and training are essential. For this reason, the Management undertakes to guarantee the consultation and participation of all workers, as well as to develop training plans for all the company's employees with the aim of achieving their qualification and awareness in order to comply with the provisions of the company's policy. The Occupational Risk Prevention policy involves: identifying and evaluating occupational risks and establishing measures to control, eliminate or reduce them. Prevent accidents and incidents arising from the activity, optimize the use of equipment and facilities, minimizing the generation of risks. Involve workers in complying with Prevention regulations and evaluate the level of effectiveness of the measures implemented. The Management of the organisation ensures that this Policy is understood and accepted by all personnel, verifying with the help of internal audits that the Management System maintains its effectiveness and appropriateness. Download the document. Quality, Environment and Occupational Health.